IL TEMPO FUGGE. NON QUI. NON ORA. 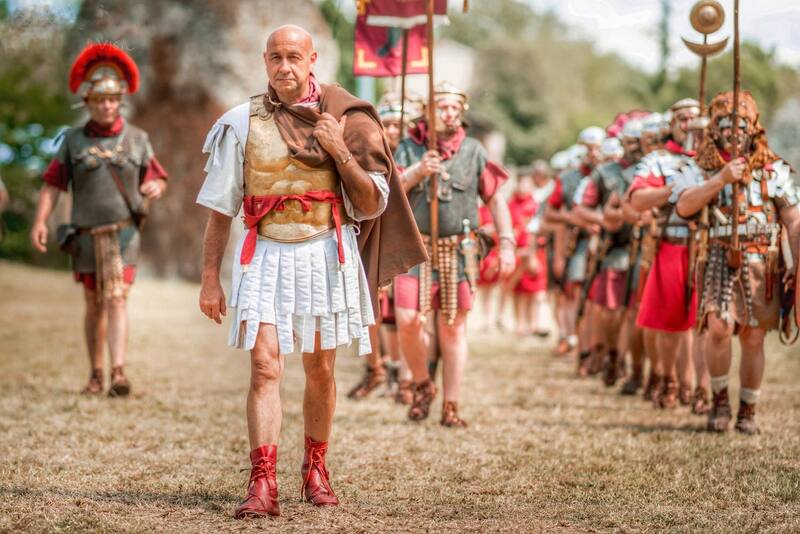 7, 8 E 9 GIUGNO: TRE GIORNI PER RIVIVERE I FASTI DI ROMA, TRE GIORNI PER TORNARE AL TEMPO DELL’IMPERATORE MARCO AURELIO, TRE GIORNI DI UN EVENTO DI RIEVOCAZIONE IN UMBRIA ALL’INTERNO DELLA SPLENDIDA CORNICE DEL PARCO ARCHEOLOGICO DI OCRICULUM. IL CAMBIO MONETA ALL’INGRESSO SARÀ LA PORTA CHE VI FARÀ NAVIGARE ALL’INTERNO DI UNA STORIA FATTA DI UN CASTRA ROMANO, UN COLORATO EMPORIUM DOVE POTER CONTRATTARE E ACQUISTARE I PRODOTTI DI ALLORA, I CAMPI DEGLI AGRICOLTORI, QUELLI DEI CACCIATORI E DEGLI ALLEVATORI. POI ANCORA LE DANZE ANTICHE E I GINNASTI, I LUDI ALL’ANFITEATRO E LA NOVITÀ DI UN CONCERTO DI MUSICA ROMANA! AL PORTO GLI ARTIGIANI, I COMMERCIATI E LE IMBARCAZIONI CHE SOLCANO IL TEVERE. E SOPRATTUTTO I TRE PUNTI RISTORO RIEVOCATIVI E UNO GASTRONOMICO DOVE POTER DEGUSTARE UN PEZZO DI ANTICA STORIA ROMANA. UNA DELLE COSE DA FARE IN UMBRIA A GIUGNO, ASSOLUTAMENTE. UN EVENTO UNICO NEL SUO GENERE, UN EVENTO DA VIVERE DI ANNO IN ANNO A OTRICOLI, IN PROVINCIA DI TERNI, A POCHI KM DALL’USCITA DELL’AUTOSTRADA A1 (MAGLIANO SABRINA). JUNE 7, 8, 9: THREE DAYS TO TURN BACK THE HANDS OF TIME AND LIVING THE FAST OF THE EMPEROR OF MARCUS AURELIUS. CHANGE YOUR MONEY, WALK THROUGH THE DOOR AND ENTER INTO A STORY MADE BY A ROMAN CASTRUM, AN EMPORTIUM WHERE YOU CAN BUY ANCIENT GOODS, FARMERS’ FIELDS, AND HUNTERS AND BREEDER CAMPSITE, ANCIENT BALLET, GALDIATORS’ GAMES AT THE ANPHITEATHER AND A ROMAN MUSIC’S CONCERT; MERCHANTS, SHEEPS AND FOUR FOOD COURTS WHERE YOU CAN TASTE A PIECE OF ROMAN HISTORY.